Heeft u een vraag voor Via Hotel Loft? 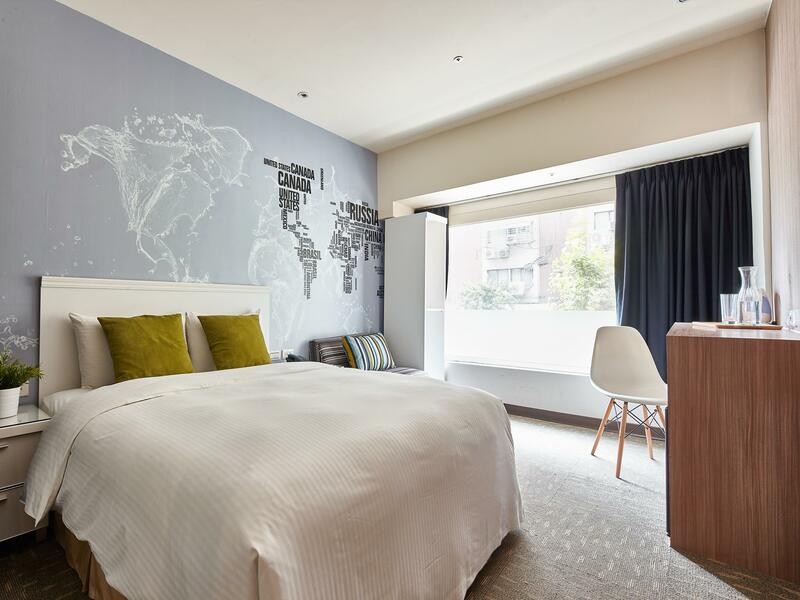 Voor reizigers die komen voor de bezienswaardigheden van Taipei, is Via Hotel Loft een perfecte keuze. Op slechts 40 km afstand, kan dit 3-sterren hotel eenvoudig worden bereikt vanaf het vliegveld. Dankzij de praktische locatie liggen alle belangrijke trekpleisters in de buurt van het hotel. Bij het Via Hotel Loft staan de excellente dienstverlening en superieure faciliteiten garant voor een onvergetelijk verblijf. Voor het comfort en gemak van de gasten biedt het hotel gratis wi-fi in alle kamers, boodschap bezorging, wasserette, draagbare wi-fi verhuur, taxi service. Hotelkamers zijn zorgvuldig ingericht om het hoogste niveau van comfort te bereiken, met handdoeken, plasma tv, draadloos internet (gratis), rookvrije kamers, airconditioning in iedere kamer. Daarnaast garanderen de talrijke recreatieve mogelijkheden dat u zich tijdens uw verblijf kunt vermaken in het hotel. 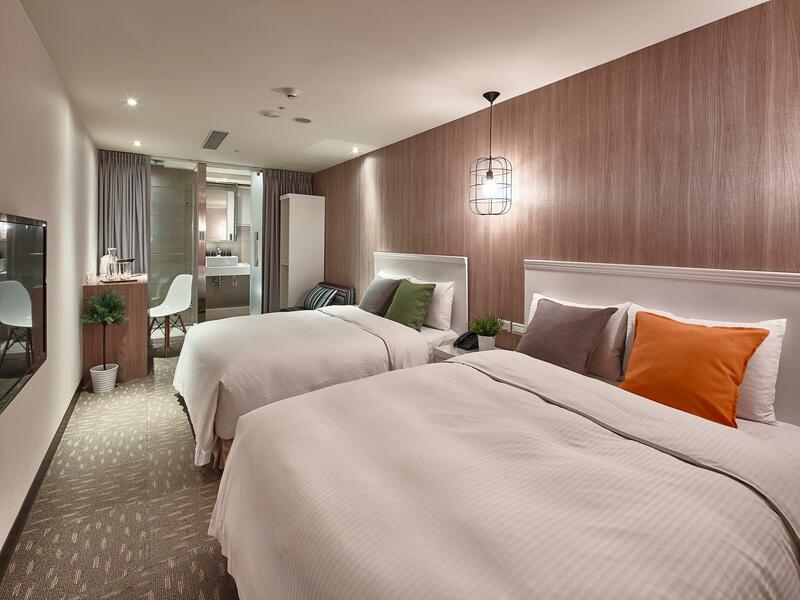 Fantastische faciliteiten en een uitstekende locatie maken het Via Hotel Loft de perfecte uitvalsbasis om van uw verblijf in Taipei te genieten. no limit supply of drinks and food, the staff is accomodative, friendly and helpful, cleanliness is perfect, the rest area is comfortable, in summary, almost everything is good, cant tell anything negative. will sure return. Clean Rooms, comfortable beds, shower with strong water pressure, adequate English channels, adequate snacks provided 24/7, staff friendly and flexible, perfect location... No complaints! Straight road approximately 8 mins walk to nearest Shuanglian mrt station . The room is spacious given the amount of cost paid . The best of which is the shower water pressure is excellent but the sound proof of the room is really terrible as was allocated a room at level 2 which is the level of the common area and reception . During night bunch of tourists will gather at the common area to chat n snack on literally could hear every words spoken inside the room . Overall an average hotel , if were to stay again I will definitely asked for higher floor room. Very good experience with Via Loft, both at Ximen and Shuanglian branch, Taipei, Taiwan. Shuanglian branch provided a dehumidifier for our room which is very helpful in drying moist clothing from the rain. Pillow was not soft but that was my preference. Toilet is well maintained but there was some water leakage across the wall partition, damping the carpet floor. Overall a 4.5/5 stars. Overall is amazing with the price, you couldn’t complain. Only draw back is that the acoustic problem. You can definitely hear what your neighbour were talking. If you stay on the 2F outside the common area, that will be the worst. 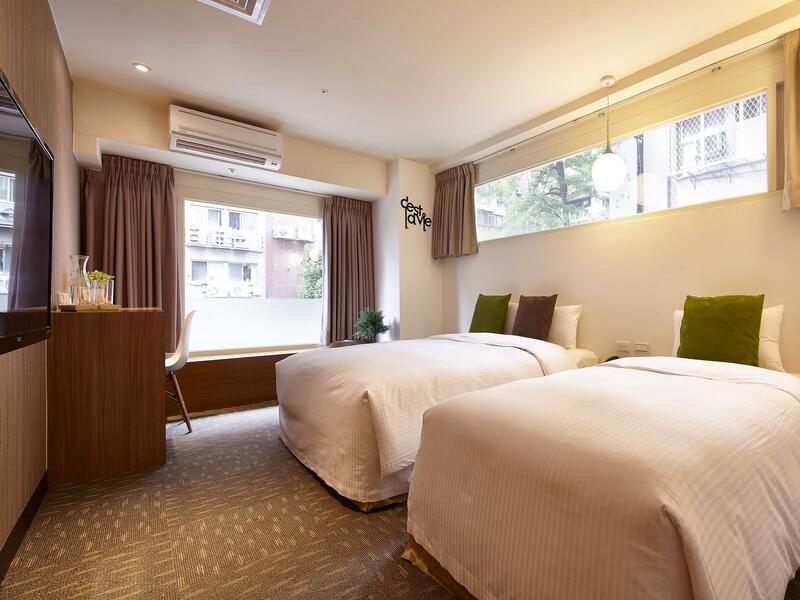 Booked the deluxe twin no window, room is true to the picture on agoda. Room is clean, bed is comfy, lots of channels on tv. Toilet is relatively spacious but for privacy you need to draw the curtains frm the outside. Hotel location is not the most convenient. It is a 10min walk from shuanglian mrt station. Came back a second time after an excellent experience previously at this hotel. Staff are nice and helpful, and the 24/7 free snacks are a major plus point. Only down side is level 3 area is noisy probably due to the loud air con system. Hotel is quite nice. It can be difficult to find because it looks ordinary shop from the outside. Lobby is on the 2nd floor. Deluxe double room looks exactly like the picture. It is fitted with thin hard carpet, small open 2-tier shelf, a costumised lounging sofa and table. Bath & toilet room has rain shower, water closet with automatic heated bidet and all the basic toiletries. They offer open pantry always stuffed with snacks, cookies, coffee, tea, soft drinks, etc. Also, they have laundry area available for all to use: 2 washer & 2 dryer. Laundry soap is provided as well. The best, i guess, is their hospitality. All staff are very polite and always ready to help. Not so prompt housekeeping.. as rooms are not ready (made up) when we are back with children for afternoon after 2pm... overall clean, good location and value for money if you are on budget. Me and my family have great stay at this hotel. The staff at reception are polite ,nice , patient and very helpful. Have nice 24 hours snack bar. What impress me that they even have free laundry. 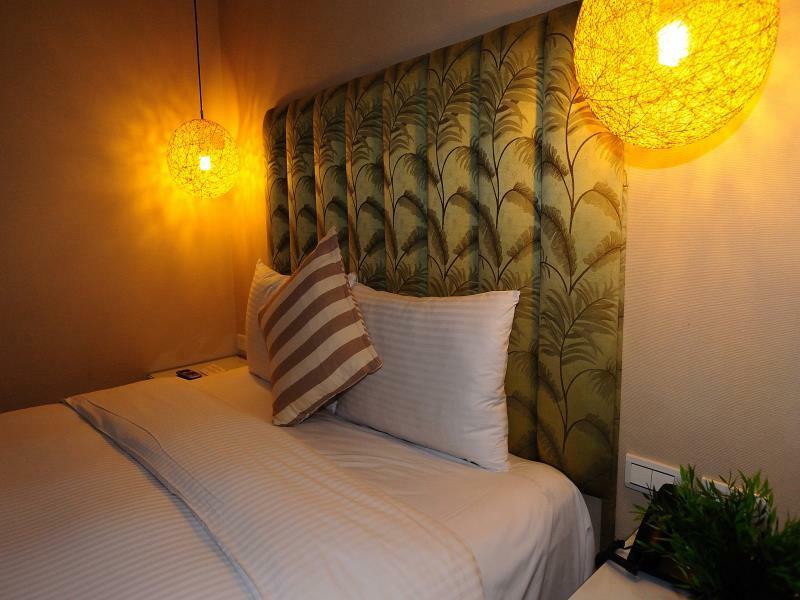 The location is very convenient and walking distance to Shuang Lian station and Ning Xia night market. As conclusion I'm satisfied and happy with my stay. Will consider to stay at this hotel again. 3rd time staying at this hotel and this hotel has not let me down. Location is great, lots of food nearby. MRT is about 10-15 mins walk. Within walking distance to the night and morning market. Rooms are clean and staff are always willing to help when requested. Good service and comes with 24hr pantry with coffee/tea and tidbits. The hotel is slightly far from train station but still within walking distance. Few steps away from traditional Taiwanese breakfast shop. Hotel Loft was a comfortable place to base myself for a week. The room was a good size and didn't feel too small. Being within walking distance to the metro was handy, and it was only two stops away from Taipei main. Check in was smooth and quick, and much appreciated at 4:30 in the morning. I found the front desk clerks to be helpful, provided me with a map of the metro stops which was helpful for planning out the order for what I wanted to do. They also kept my bag all day for no extra charge since my flight did not leave until 1 am, as well as organizing a taxi to Taipei main to catch the metro to the airport, including writing down my destination so that I could show it to the driver. It was nice to have a selection of snack on offer at all times, and I really appreciated having hot tea/coffee/hot chocolate when I returned at the end of the day. I also like that this gave me an opportunity to try some things without committing to a full meal. The best part of this hotel is the staff, they have the best customer service. They always help me out with directions and always willing to help. Free drinks is a plus. The hotel is a bit hard to find for taxis and Ubers as there is not big sign outside. When I returned back to the states, I did get a few bed bug bites. So kinda concerned about that for my next stay there. The warm hospitality from the front desk and ever so helpful. We got there early and was given a room. The hospitality was great when we were offered hot drinks and light snacks (absolutely free). The beds perfect (so comfy and world class). The room size is decent and toilet very stylish. 7eleven and Family mart in between, you can always run down to get anything. 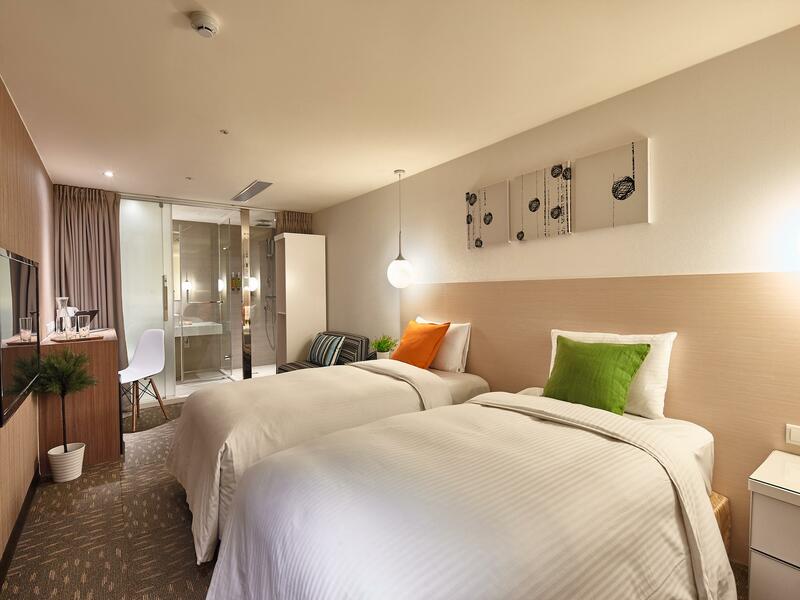 The hotel location is perfect, easy to catch a bus, taxi and its even a short walk to the MRT. Housekeeping was superb, clean rooms all the time and spotless. Laundry service is a plus and its free. The even include in a drier. Perfect time in Via Hotel Loft. Pros: near convenience stores, restaurants and shopping areas; spacious room; 24-hour free snack bar; massage pillow in room; accommodating staff (they allowed us to check in early); clean; around 10-mins walk to train station Cons: there weren't any big deal cons - toilet was faulty (it had these advanced buttons that don't work, but functioned well as a "regular" toilet). Overall though we had a great stay! Great stay at this hotel. Great value for money. Staff was very accommodating and helpful. Rooms were clean. 24/7 snacks and coffee. 5 min walk to the train station and 10 min walk to the night market. Walls are a little thin but for this price point, this is very acceptable.